Sunny summer weather is perfect when you're budgeting. You don't have to spend a lot of money to enjoy the great outdoors, and one of the best places to enjoy a cheap day out has to be the seaside. 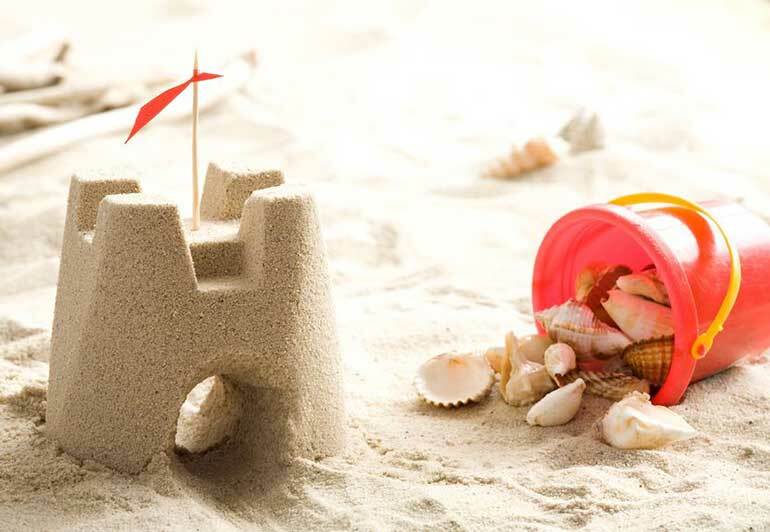 You can enjoy a good few hours of entertainment paddling in the water and relaxing with a book on your beach towel, but surely the best beach activity is taking part in a sandcastle building contest. If you're saving money during the day it means you'll have more money for splashing out in the evening. Our free money management software can help you to keep track of your summer budget, so you'll know when you can splash out on big events and when to keep things low key with a trip to the seaside. Building the perfect sandcastle isn't about luck or experience: it's about science. And if you follow these tips, you'll be sure to impress your friends on the beach. Water works at a molecular level, creating bridges between the grains of sand. Basically, your sand won't stick together without water. Generally speaking, it's impossible to add too much water. You just need to make sure excess water has a place to drain off to so that you don't end up with a big pile of mud. Well, you can bring them, but don't use them to mould your sculpture. Professional sand sculpters use their hands to compact their wet sand, and this has been backed up by scientists as the best way to do it. Using the bucket as a mould means that there's nowhere for the water to drain off to, which creates resistance when you try to tip the sand out. Using a spade to compact the structure can damage the water bridges, and make them unstable. It's best to get in there with your hands. Use your hands, feet, or compactor tools to squish the sand as tightly as possible. This shortens those molecular water bridges we mentioned earlier, making the sand stronger. The more compact the sand is, the easier it is to work with. You can even make intricate carvings, if you want to be extra fancy. Running back and forth to the sea to get more water is pretty time consuming. When you're in the middle of building your masterpiece, you don't want to leave it, so the best thing to do is dig a well. Just dig a hole on the beach with your hands and keep going until you hit water. Once you reach the water level you'll have your own supply of fresh wet sand.